Atom Snap 'em™ There are 37 products. Atom Snap'Em. Organic Set II. These kits are essential for demonstrating the structure of different organic and inorganic compounds. Contains Small items, image may vary. 671-2015 Atom Snap'Em Organic Set II: 20 hydrogen, 4 halogens, 1 alkali metal, 12 carbon, 6 oxygen, 2 deep blue group 14, 2 nitrogen , 1 yellow group 14, 1 yellow group 2, 1 silicon. 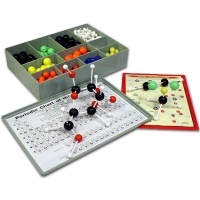 Use this set to model different organic and inorganic compounds. 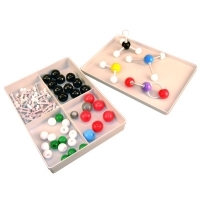 Includes 150 connecting lugs, 370 colored balls, molded storage box with compartments and Periodic Table of the Elements.